The idea was that Carl Linnaeus should follow in his father's footsteps and become a clergyman. Thus, when he was seven he was provided with a tutor, Johan Telander, to teach him to read and write. Johan was 20 years old and was soon to complete his school studies and therefore Carl went with him to Växjö where the school was. 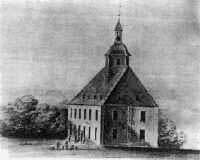 Linnaeus’ school in Växjö. The building is still there. Since Stenbrohult was 50 km from Växjö, Carl could seldom go home to his family. Johan was harsh towards the boy who shared his living quarters. When Johan was in school Carl sat at home studying hard, preparing for the day when he himself would be able to go to school in Växjö. If he hadn't learnt his lessons by the time Johan came home, he would get a thrashing. When Carl reached the age of nine he was accepted into the school. The teachers were stern and did not think much of their new pupil's interest in nature. The pupils knelt at their desks and wrote with quills dipped in ink. There were hardly any books, they were too expensive, and so mostly Carl and his fellows had to learn everything by heart. When necessary, the pupils had to go outside and cut birch twigs with which they were beaten if they had misbehaved. Schoolwork in the main was meant to prepare the pupils to study for Holy Orders. Carl's passion for nature caused him to neglect his school books and he would play truant in order to be out of doors. The situation became impossible and the teachers sent for Nils Linnaeus. Later in life Linnaeus describes the incident:" The teachers recommended his father to apprentice his son, as soon as possible, to some craftsman since they were convinced that he could make nothing of book-learning". Nils Linnaeus was horrified but was soon reassured by the Natural History teacher, Dr Rothman, who thought that the medical profession might be an alternative. Since "medicine" in those days implied all kinds of natural history, this suited young Carl very well. His father had to adjust to the situation but shirked telling his wife this news for several months. Medicine had low status at the beginning of the 18th century and Carl's mother sobbed and cried – "is poor Carl to become nothing but a simple barber surgeon?"